Dr. Trac Duong received his B.S. and M.D. degrees from Yale University. After finishing residency training in Otolaryngology–Head and Neck Surgery at the University of California, Los Angeles (UCLA), he completed fellowship training in Otology and Neurotology, which is the surgical subspecialty for diseases of the Ear. He had the privilege of receiving further fellowship training in advanced skull base surgery under the direction of Dr. Mario Sanna at the internationally-renowned Gruppo Otologico in Italy. He is board certified by the American Board of Otolaryngology. 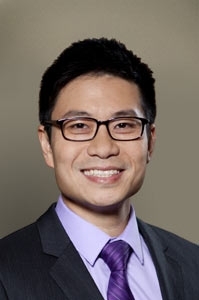 Dr. Duong’s practice includes all aspects of adult and pediatric Otolaryngology with a special interest in treating disorders of hearing, balance, and infections of the ear and skull base. He has performed many operations to improve hearing including BAHA and cochlear implantation. In addition, he is experienced in diagnosing and treating patients with dizziness and vertigo, including Meniere’s disease. Dr. Duong considers it a privilege to care for his patients. He believes that excellent and compassionate care starts with listening and taking the time to educate his patients so they can be more effective partners in their own care. Alysse Moury practices audiology with a focus on diagnostic hearing assessments and aural rehabilitation solutions including proper hearing aid fitting and maintenance. Alysse received her Bachelors of Science degree in Speech and Hearing Sciences from the University of Washington and her Doctorate of Audiology from Idaho State University. Alysse is passionate about audiology and enjoys being part of a collaborative team to aid in the diagnosis and treatment of hearing and balance disorders. Alysse spends her time away from the clinic with her husband and son enjoying all that the Pacific Northwest has to offer. They are also avid sports fans and especially enjoy watching Husky athletics. Go Dawgs! Jacqueline Neel received her Master of Science in Audiology from the University of Washington and her Doctorate of Audiology from A.T. Still University, Arizona School of Health Sciences. Jacqueline practices audiology with a focus in diagnostic assessments, particularly with an interest in assessing patients who are having difficulty with dizziness and balance. Her primary goal is to provide patients with the highest quality care in a comfortable and caring environment. In her free time she spends time with her husband and two children. She enjoys reading and exercising outside. Hillary Perry is a licensed Audiologist with a focus on diagnosis, treatment, and management of hearing loss. Hillary received her Bachelors of Science degree in Speech and Hearing Sciences from the University of Arizona, and her Doctorate of Audiology from the University of Washington. She is committed to providing compassionate and collaborative management practices throughout her patients’ hearing loss journey. Hillary is dedicated to empowering her patients through individualized care and assisting them in reaching their communication goals. Corina Peterson practices audiology with a focus in audiological assessments and balance disorders. Corina obtained her Bachelor of Science degree (BS) in Speech and Hearing Sciences from The University of Washington and her Master of Science degree (MS) in Audiology from Arizona State University. She obtained her Doctorate of Audiology (AuD) from Arizona School of Health Sciences. Corina has provided compassionate, quality care for the patients at Bellevue ENT for over ten years. She finds it rewarding to work closely with other providers to aid in the diagnosis and treatment of hearing and balance disorders. When Corina isn’t in the clinic, she enjoys spending time with her family and spending time outdoors. Eliza beth Ripley is a licensed audiologist with a interest in diagnosis and treatment of hearing loss. Her areas of interest include hearing testing, hearing aids, and cochlear implants. Elizabeth received her Bachelor of Arts degree in Communication Sciences and Disorders and her Doctor of Audiology from James Madison University in Harrisonburg, VA. Elizabeth enjoys being part of a patient’s hearing journey and working in a collaborative team to provide superior hearing healthcare.